Rabia Chaudry is an attorney and recent Jennings Randolph Senior Fellow at the United States Institute of Peace (USIP), where she researched the intersection of religion and violent extremism. She is the co-host and co-producer of the hit criminal justice podcast “Undisclosed,” with nearly 250 million downloads, and the author of the New York Times bestselling book, Adnan’s Story. She is also the co-producer and co-host of the weekly podcast “The 45th,” which examines the politics and policies of the Trump administration. Prior to her work with USIP, Rabia Chaudry served as an International Security Fellow at the New America Foundation (NAF), where she led a Countering Violent Extremism (CVE) community project in partnership with Google, Facebook, and Twitter. Her work at NAF focused on the empowerment of American Muslim communities in social media advocacy. Chaudry also is the founder of the Safe Nation Collaborative, a CVE training firm. Safe Nation Collaborative worked on two fronts: providing CVE and cultural competency training to law enforcement, correctional, and homeland security officials, and providing national security and CVE training to Muslim communities and institutions. Rabia Chaudry is a Fellow of the Truman National Security Project, a Fellow of the American Muslim Civic Leadership Institute, a Fellow of the Shalom Hartman Institute, a member of the national Muslim-Jewish Advisory Committee, and a member of the Vanguard Board of the Aspen Institute’s Society of Fellows. She is a frequent writer and public speaker on issues of social and criminal justice, faith and gender, and national security. She is the recipient of the Truman National Security Project’s 2015 Harry S. Truman Award for Communications & Media Influence, a 2015 Carnegie Corporation Great Immigrant, and the recipient of the 2015 Healing & Hope award by the Campaign for the Fair Sentencing of Youth. Rabia Chaudry received her Juris Doctorate from the George Mason School of Law and practiced immigration and civil rights law for over a decade before moving into the CVE policy sphere. You can follow Rabia on Twitter and Facebook. In early 2000, Adnan Syed was convicted and sentenced to life plus thirty years for the murder of his ex-girlfriend Hae Min Lee, a high school senior in Baltimore, Maryland. In this compelling narrative, Rabia Chaudry presents new key evidence that she maintains dismantles the State's case. Adnan's Story also shares Adnan’s life in prison, and weaves in his personal reflections, including never-before-seen letters. Chaudry, who is committed to exonerating Adnan, makes it clear that justice is yet to be achieved in this much examined case. Murder case of State vs. Adnan Syed/Adnan’s Story This case was made popular through the global phenomenon podcast Serial, which examined the 1999 murder of Hae Min Lee and conviction of Adnan Syed, the wrongfully convicted man still in prison for the murder. Rabia has been Adnan’s public advocate and friend for the past 17 years and has now written Adnan’s Story in collaboration with Adnan, documenting his ordeal. Podcasts Serial and Undisclosed Rabia is the co-producer and co-host of the podcast Undisclosed, which followed Serial with a deeper investigation into the conviction of Adnan Syed, and now has over 80 million downloads. The success of both of these podcasts reflect that we are in a new era where crowd-sourcing, social media, and new media is taking advocacy to a new level. As a community activist, Rabia has learned much from this experience, and she is committed to sharing these lessons on how to realize social change using digital media. Criminal Justice Reform We are at a crossroads in criminal justice reform in the US. From Black Lives Matter, to increasing exonerations, America is seeing the “justice” system for what it really is. And it doesn’t like what it sees. Countering Violent Extremism or Extremist Radicalization Since 9/11, we have been at constant war with terror. But this war has inadvertently opened a Pandora’s Box of violent extremism and terrorism that impacts not just the Muslim world, where terrorists kill more people than any other region. It also impacts us in the West, where young people are joining the ranks of extremists groups and domestic law enforcement is seeing terrifying spikes in militant organizations. What is driving extremism, and how do people get radicalized? Interfaith Relations Almost all successful social justice, human and civil rights movements included the participation of faith groups, but we still fail to employ the persuasive power of interfaith coalitions, religious leaders, and connected congregations to influence policy on dozens of pressing matters, from gun reform to Israel-Palestine. Rabia has lived a life deeply connected to people of other faith, for friendship and advocacy, and believes that the unique nature of America allows such relationships in a way that does not exist in any other part of the world. Read the full Kirkus review on Adnan’s Story. Read Rabia’s reflection on the podcast, Serial, published in Time. Read Rabia’s blog, Split the Moon, on Adnan’s case. Listen to Rabia’s podcast, Undisclosed. "Rabia was a phenomenal speaker and exceeded our already high expectations. Both she and her agent were very flexible and worked with us to meet our needs for the event. She tailored her impressive resume and experience to the audience and I think everyone in the room wished they had more time to hear her speak." "As the first speaker of the year for the Wayne State Muslim Law Students Association, Rabia Chaudry exceeded the expectations of the student organization’s members as well as members of the greater university community. Her thoughts on the Adnan Syed case, as well as her thoughts on other professional and personal experiences were engaging, enlightening, and educational. She was also personable, a trait that was rapidly recognized by audience members who posted their observations online via Twitter and e-mail." "The Division of Diversity, Equity, and Educational Achievement at UW – Madison had an excellent experience with Rabia Chaudry and her participation in our annual Diversity Forum. Rabia’s keynote address was one of the most heavily populated portions of the day, and the room overflowed with enthusiastic guests who looked forward to hearing from one of the most prominent leaders fighting for change within the criminal justice system...Even with her tight time constraints, Rabia made herself available at the end of her address for any individual questions that the attendees had and for a book signing with the guests..We appreciate all of the preparation and dedication that Rabia showed leading up to the event, and we are proud to have had such a well-informed and experienced speaker address our campus. She will definitely be a tough act to follow." "Informative and inspiring, Rabia Chaudry’s talk was well-received by an appreciative audience. Rabia answered many questions and signed books for all who asked." "I heard you speak on the USIP panel for Women, Social Media, and Violent Extremism, and found your explanations about identity and messaging to be very helpful and informative. Thank you. I work in the field of explanations about identity and messaging to be very helpful and informative. Thank you. I work in the field of youth development and violence prevention and your work is informing my thinking in this area. I look forward to following your work." "The highlight, of course, was getting to hear Rabia speak and I wish I could have her speak on the subject of motherhood 8 years sooner." 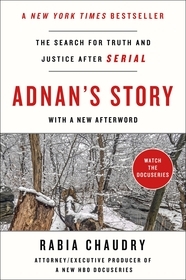 "[Adnan's Story is a] page-turner...[Chaudry's] writing is clear, eloquent, and engaging, and her case is convincing."